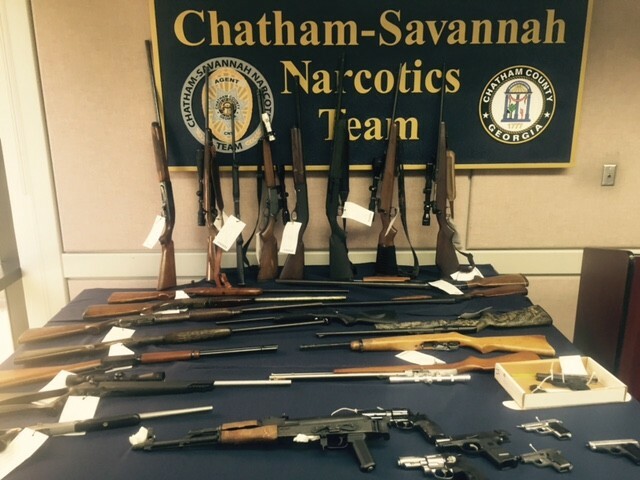 Nearly 50 people have been arrested or are currently wanted following a lengthy investigation conducted by the Chatham-Savannah Counter Narcotics Team (CNT). In October 2013, CNT, in a partnership with the Drug Enforcement Administration Savannah, began investigating multiple people believed to be involved in the sale of crystal meth, throughout Chatham County, Georgia. "Undercover CNT agents quickly identified various members of the organization and began making purchases of crystal meth from the members. CNT continued making purchases through February 2015 to include purchases in Chatham, Henry, DeKalb and Newton Counties," a CNT spokesman says. As the investigation furthered, CNT identified additional members to include those connected to the prison and street gang, Ghost Face Gangsters, also known as GFG. "The Ghost Face Gangsters is an affiliate of the Aryan Brotherhood, a white supremacist prison gang and crime syndicate in the United States. It is believed to have more than 3,000 active members throughout the south eastern states. The Ghost Face Gangsters are heavily involved in drug trafficking and most are career felons," the CNT spokesman says. During the course of CNT’s investigation, agents identified Christopher Henry, a high ranking member of GFG, as the top tier of the organization. Throughout the investigation, C. Henry was in custody in Wilcox State Prison in Georgia where he regularly communicated with his wife, Regina Henry, also a member of GFG. Regina Henry, who lived in Henry County during the investigation, regularly supplied large quantities of crystal meth that was then transported to Chatham County and distributed. In January 2015, CNT along with members of the Henry County, DeKalb County and Newton County Sheriff’s Office and DEA, executed search warrants at three residences. During the search warrants, crystal meth, firearms and items commonly associated with the distribution of controlled substances were seized. No arrests were made by CNT at the time of the search warrants. In early March 2015, CNT with the assistance of the Chatham County Sheriff’s Office (CCSO) executed a search warrant of a residence located in unincorporated Chatham County. There, agents seized nearly one pound of crystal meth. One person was arrested and a newer model Chevrolet Camaro was seized. Days later, CNT with assistance from CCSO, CCSO K-9, Savannah-Chatham Metropolitan Police Department (SCMPD), SCMPD SWAT, Garden City Police Department and the Effingham County Sheriff’s Office executed two search warrants in Garden City, one at a residence and one business, and one at a residence in Effingham County. Multiple people were arrested following the seizure of crystal meth, firearms and items commonly associated with the distribution of controlled substances. Guadalupe “Pito” Villafranco, one of the main distributors in Chatham County, was arrested at a hotel in Beaufort, South Carolina after attempting to flee from CNT. CNT arrested Villafranco with the assistance of the Hardeeville Police Department and the Jasper County Sheriff’s Office. On April 15, 2015, a total of 48 people were indicted by the Grand Jury of the Superior Court of Chatham County, Georgia. As outlined in the indictment, all persons were involved with the distribution of crystal meth. All persons indicted were charged with Attempt/Conspiracy to Violate the Georgia Controlled Substance Act, Trafficking Methamphetamine, Sale of a Controlled Substance (Methamphetamine), Possession of a Firearm during the Commission of a Crime, Possession of a Firearm by a Convicted Felon, and Hindering Apprehension. Of the 48 people indicted, 32 had prior felony convictions and 29 had prior arrests in Chatham County. During the course of the operation, nearly one kilogram of crystal meth was seized. The seized meth has an estimated street value of up to $100,000. Agents also seized 38 firearms, most from convicted felons, and nearly $24,000 in U.S. currency.